Competition demands dominion. Dominion begets power. And, if you're serious about keeping that power, chances are power weapons come into the picture. Power weapons are tools that allow us to deal immense damage. Think stuff like sniper rifles, or even vehicles like tanks. These can dictate the entire flow of the match, so it's not surprising that they're so important in multiplayer games. Players must resolve to always be in control of power weapons, even if they're not using them. I'd go so far as to say that, if done right, power weapons are one of the elements that define the entire experience. What is Gears of War without its chainsaw gun? 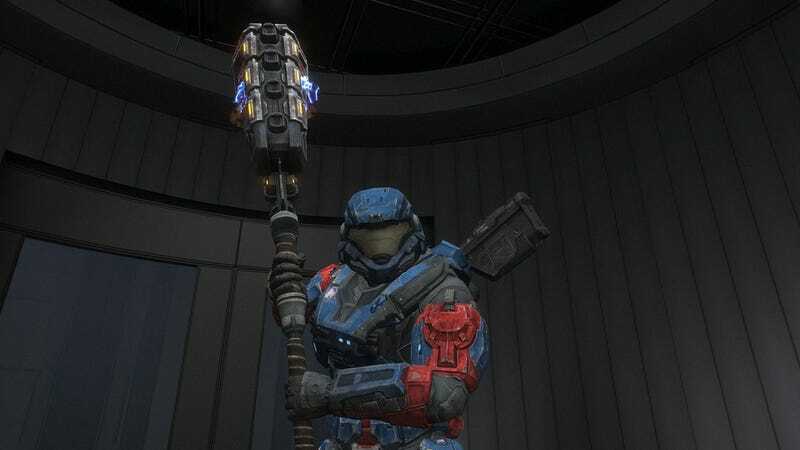 What is Halo without the Energy Sword? Having your stock rocket launcher, your sniper rifles, your shotguns is simple enough; many games have them. Developing a good power weapon is much more difficult. This is my criteria for the makings of a good power weapon—though naturally, a weapon doesn't have to fulfill all of these traits at once. Weapons in a game are like extensions of ourselves. They represent us in some way. Think about it: you often can't see more than your hands and your gun, so you might as well say you are are the gun. And if the purpose of most games can be boiled down to "power fantasies," then a good power weapon knows how to make a player feel like a badass. My favorite example here would have to be the Ghost from Halo. The glide of the vehicle is otherworldly, making zipping through the maps a joy even if you're not shooting anyone. It's what I imagine handling a futuristic motorcycle would be like—the very epitome of cool. You can't just give a player immense power without there being a catch. It's partially a matter of balance: making a weapon dangerous to use gives other players a fighting chance. It's also a matter of design—the 'reward' is all the more satisfying if it's something that could easily ruin you. Never underestimate the thrill of dancing with danger and then getting away with it. As an example, the OneShot in Gears of War takes a normal sniper rifle and super charges it. It's literally one shot one kill, no matter where the shot lands—and it can go through some cover. It also has a long charge time, a visible aiming laser, it's audible, and scoping in makes it difficult to be cognizant of what's going on around you—which makes you easy pickings. The benefits of risk and reward also explains the recent obsession with bows and crossbows in many multiplayer games (Tomb Raider, Far Cry 3, Crysis 3, Gears of War: Judgement, etc)—bows often require enough precision that, should you miss, an enemy can probably gun you down before you have a chance to take another shot. If you don't miss, though—chances are one arrow is all it takes to kill someone. What use is having a power weapon if it's much like your normal weapons—or hell, like the weapons in other games? You can't feel cool with a run of the mill gun; that's why stuff like "rocket launcher" doesn't make the cut. A unique power weapon is also necessary to establish a game's identity and flair, ultimately encapsulating what sets game X apart from game Y.
Uncharted is the game where you can call down spiders on people. Call of Duty is the game where you can nuke the entire playing field. Gears of War is the game where you can chainsaw people with a lancer. All rather memorable experiences—and memorable games. This aspect is probably the most difficult. This is somewhat related to risk and reward, in that it's both a balancing issue (players have to earn the right to use a power weapon) and that, if done right, complexity and nuance make the payoff that much better. Giving a weapon complexity and nuance also keeps things interesting for the player, which is good for long-term gaming. If adhered to, complexity and nuance means the weapon requires some form of mastery to use—which eliminates stuff like 'noob tubes' from consideration. Would piloting an Apache in Battlefield be the same if anyone could do it with ease and finesse from the get-go? Probably not. And the same goes for figuring out, say, the nuances of how the Scattershot bullets in Halo bounce off surfaces, or how the many ways in which you can use a Digger in Gears of War is as enjoyable as the moment when you pull the trigger. And what of normal guns? Arguably, they should follow all these mandates too. I'd say that the best weapons empower you such that, with proper usage and know-how, there's barely any difference between a power weapon and a normal weapon. That's why even small side arms, like the Magnum in Left 4 Dead, can feel so powerful despite not being a special gun or ability. I'm curious, though: what are some of your guys' favorite power weapons or abilities in games? What about them is special or interesting? Sound off in the comments!